The #1 New York Times bestselling author Sheri Reynolds returns with a "nontraditional devotional"--at once a hilarious and inspirational novel packed with profound advice from the journey of the unforgettable Myrtle Cribb. Myrtle T. Cribb, a special-needs teacher from Virginia's Eastern Shore, is captive in a dysfunctional marriage. Tired of living up to her husband's and everyone else's standards, Myrtle impulsively heads to wherever the road will take her. But soon she gets a surprise of her own. She finds an unlikely stowaway on her journey: Hellcat, the local drunk. Together, they embark on a pilgrimage that takes them everywhere from a shady highway motel to a hippie retreat center, developing an unlikely friendship while finding wisdom in the most unlikely places. The journey forces Myrtle to evaluate her marriage, her priorities, and her own prejudices, and compels her to share her hard-earned insights with other women who feel some dissatisfaction in their lives. 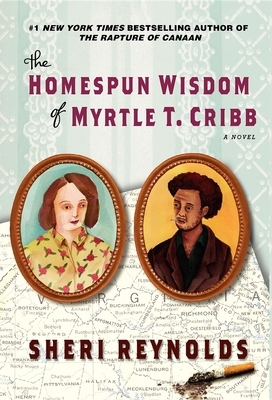 With its iconoclastic, complex, and irresistible cast of characters, and bold yet sincere advice, The Homespun Wisdom of Myrtle T. Cribb is an engaging, heartbreaking, and joyful story to be cherished by those seeking an understanding of life's greatest mysteries. Sheri Reynolds is the #1 New York Times bestselling author of five novels, including The Rapture of Canaan. She lives in Virginia and teaches at Old Dominion University, where she is the Ruth and Perry Morgan Chair of Southern Literature.